Body wash is the one of the few things in my routine that I'm constantly rotating. A lot of the time I tend to stick to the more budget friendly side of things, but every now and then I love trying something a bit more luxurious. The two products I've been using recently are these body washes from Patyka - they're pretty much the epitome of luxury! The bottles look so nice on display in the bathroom I almost didn't want to start using them! The Mandarin "Dynamising" Body Wash* is perfect to use in the mornings with it's awakening zesty scent, whereas the Iris Wood "Gentle Cheerfulness" Body Wash* takes a more subtle awakening approach with a mild, sweet and floral scent - they both smell amazing! These body washes give off a light foam and have a gentle, non-drying formula made with 99% natural ingredients. They can also be used as a bath soak too, although I've only used them in the shower myself. It's so nice to inject a bit of luxury into your mornings occasionally and I think these would make perfect gifts, especially for anyone with expensive tastes! Each bottle has a high-end price point of £28, available online from Brummells of London. 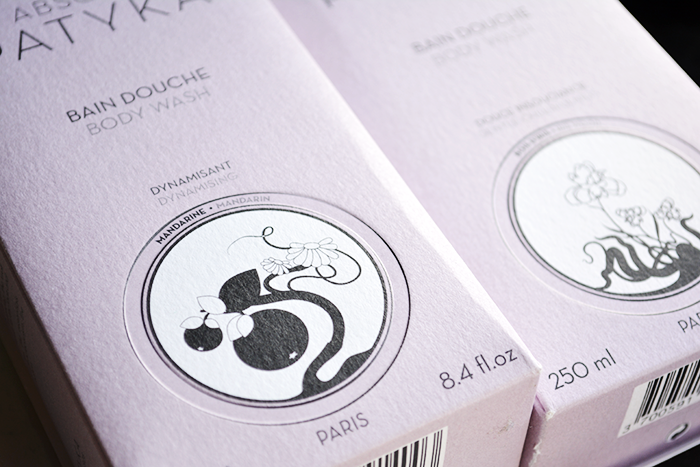 I couldn't finish this post without a mention of the fold-out boxes these body washes are packaged in. The boxes are "tree-free" and recyclable, made from sugar cane residue, flax and hemp. There are these gorgeous illustrations on the front, and the inside of the boxes are printed with facts about the brand in different languages and the nicest little poems! Do you like treating yourself to more luxurious products? Have you tried anything from Patyka before? Eek £28! They look really luxurious though! Hey Hephzibah, here's the ingredient list of the Iris Wood Body Wash for you to check out! "Aqua (water), rubus idaeus (raspberry) fruit extract*, ammonium lauryl sulfate, cocamidopropyl betaine, propanediol, parfum (essential oil fragrance)*, sodium benzoate, citric acid, benzoic acid, linalool, sodium phytate, citronellol, geraniol, potassium sorbate, alcohol.